So far, I have had the UP for about two weeks and I do feel better and have lost some weight, but not because the band did it, rather because I did it. Because I was able to see what I ate, how idle or active I was and maybe I am a bit of a carb lover, I was able to live a little healthier. I like to call my UP band my reminder. Yes you have to manually log in your food intake and some workouts, like weight lifting, but they have designed it to be soooooo easy. Also, it is very detailed so you don’t feel like you are getting a completely inaccurate reading. 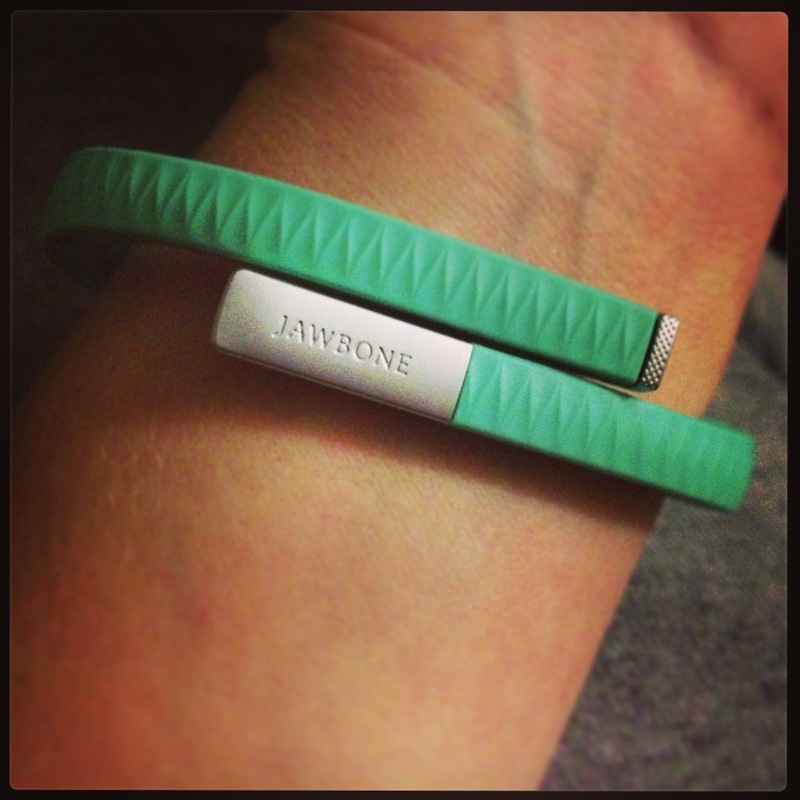 In order for the entire UP system to work you need: a Jawbone UP band, the UP app, and of course yourself. 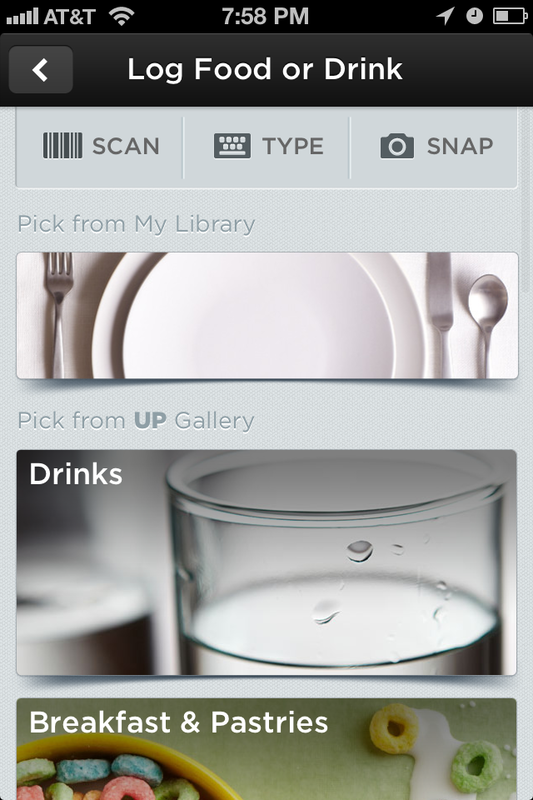 This is what your home screen will look like on your UP App. This image was taken at the end of one of my days so that you can see how it logs everything in a simple chart. The purple column represents the amount of sleep I got, the orange represents my activity, and the green is my food and water. See how the orange column says 122%? I have a goal programmed into the program of reaching 10,000 steps a day, which can be difficult considering I am at a desk all day. 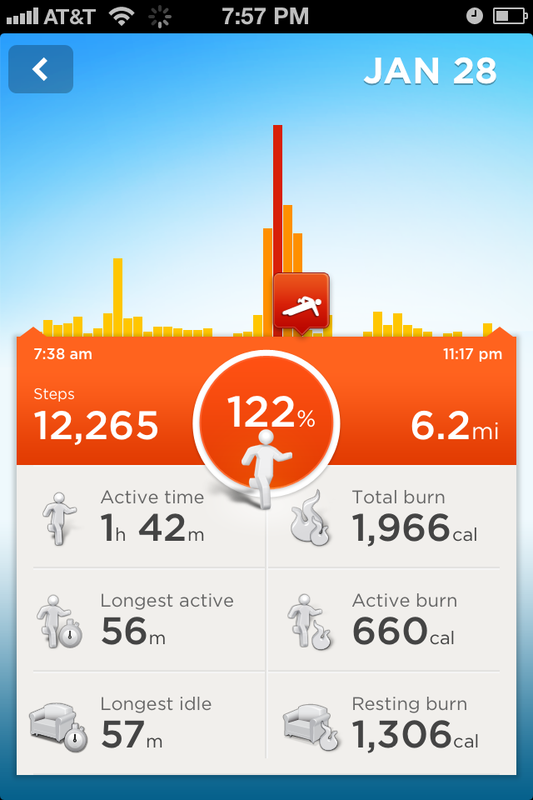 I exceeded my goal this day and so the app lets me know! 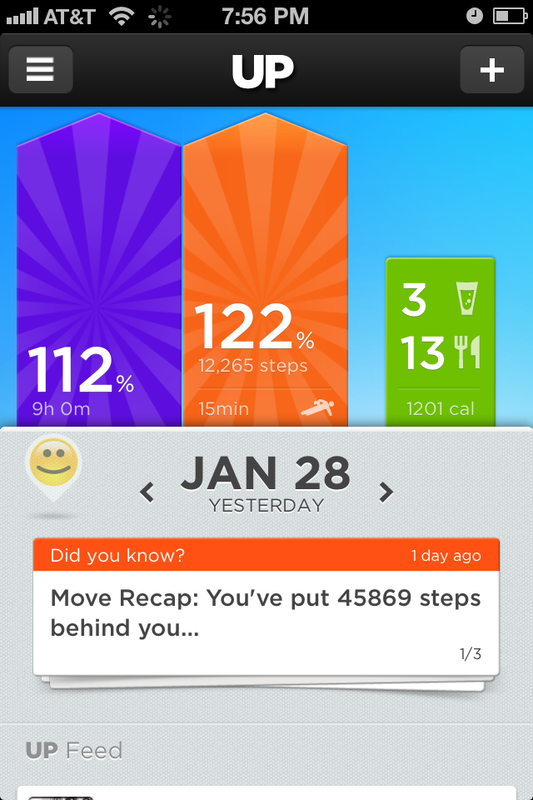 By clicking on the orange (active) column, it will give you the specifics on your entire day. 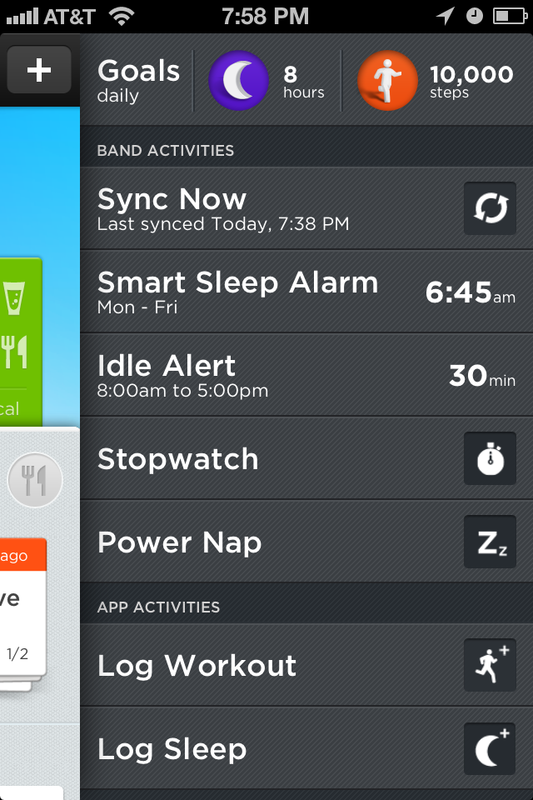 Now, you don’t have to wait until the end of the day to see all of your stats, you can plug in your UP band to your phone, computer, or iPad, at any time and it will five you a reading up to the time you plugged it in. 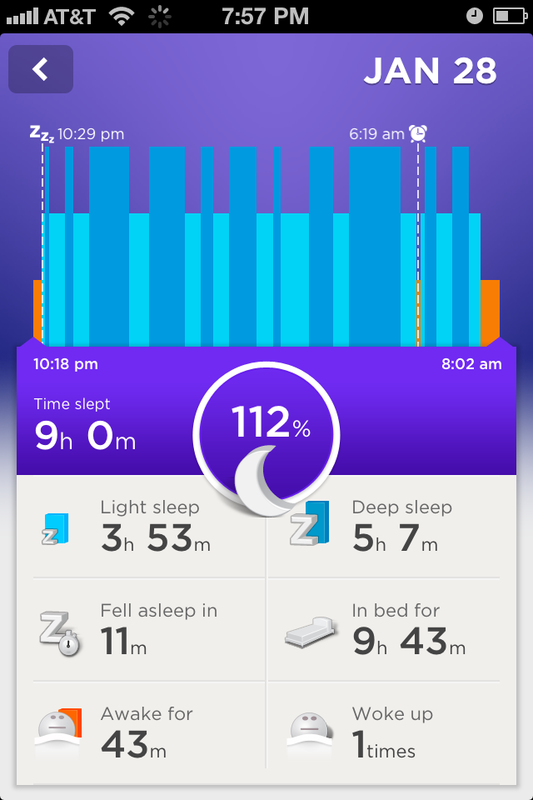 When clicking on the purple (sleep) column, this lets you know way more than many think they could know about their sleep. 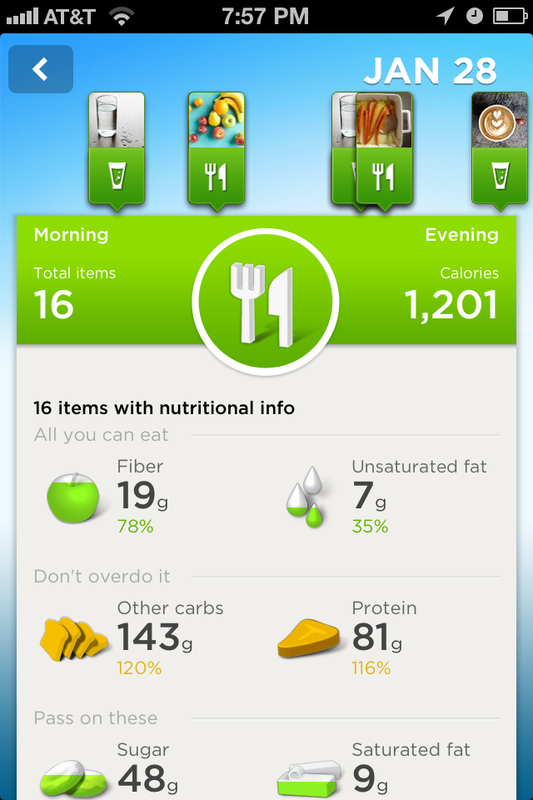 The green (nutritional) column, shows you if exactly what you ate. I obviously ate too many carbs and protein that day, but I’m not going to cry about it. It’s a real eye opener to see where you are getting your nutrition from. This is the screen that comes up when you are entering your food. Beyond Breakfast & Pastries, there are 7 more categories to choose from. Each category has a wide range of items to select from. In fact, there hasn’t been one food that I have not found. Better yet, at the top of the screen there is a scan button. You click on that and scan the barcode of the item you are consuming and all the info comes up, you just have to adjust how many servings you had. You can also take a photo of the food you ate, just in case you want to recreate it again. This image shows the more manual side of things, where you would log in anything that you did. Just like the nutritional part, there are a wide range of activities and you can adjust the intensity of your workout, the duration, etc. Being active all my life and then becoming accustomed to being sedentary has been a hard transition for me. The Jawbone UP has helped me to remind myself that it is important for me to be healthy and not to just completely veg out. I would recommend this product for anyone who has enough drive to living a healthy lifestyle themselves, but needs just a little something to keep it up. Go Ahead and Get a Move On! Artwork by Laura Laine. Click on image to view more of here amazingly beautiful work. For this Things to do Thursday, Polka Dot Tango decided that one thing everyone should do is make a decision. Each and every day, we are faced with decisions, big and small. Do I want to wear my hair up today or down? Do I really feel like I need a venti or should I just stick with my grande? Should I sell my car or just enjoy not having payments? Should I quit my job or keep it? The only thing in common with these questions is that you have a choice. The difference, some could ultimately change your life. I know Dr. Seuss made up crazy words and insane little characters, but if you think about it, he started out doing ads and then decided to dive head first into his own made-up world. Because of that…he is a household name that only has positive connotations with it! Applause indeed! So, this Thursday, attempt to get closer to having “that decision” made or if you’re feeling wild, just make it. On tinybuddha.com, there are some tips on how to make a decision, and we have selected a few. But in the end, no one can tell you how to decide or what your choice should be, only you. I promise that once you do decide, you will be excited and terrified, which are both explosive emotions. So run with that energy and from deep down in our hearts we wish you the best of luck! Lesja Chernish. Click on image to view more of her work. When you wake up, in the middle of the day, at the end of the day, you may experience this certain state which I prefer to call “tired”. My first passing thought is to crawl into bed and take a nice peaceful nap, but, I have heard this isn’t the best option. After perusing the internet in search of what to write for Wellness Wednesday, I came across a website I used to frequently visit called zenhabits.net. I had forgotten how simple this website is on such a variety of topics. All of course are to benefit your well being. Lo and behold, an article screamed at me, “55 Ways to Get More Energy”. Hello! I could only really think of one, maybe two. I would also like to note that this article is not a direct product of zenhabits.net, but of Greg Go, co-author of Wise Bread‘s new book, 10,001 Ways to Live Large on a Small Budget. So, take a look and see if any of these 55 interest you in getting some energy into your day! Let us know if this article missed anything or if you know one of these works for you. You won’t be able to do everything on this list all the time — you’d tire yourself out trying to get more energy — but do try them all to see which ones work for you and your schedule. Add a few of these tips to your regular routine. Or mix them up to keep things interesting. 1. Change your socks for refreshment. It’s an amazing trick. Bring a change of socks to work, and change your socks midway through the day (say, after lunch). You’ll be amazed at how much fresher you’ll feel. This trick is especially handy on days with lots of walking — like during a hike or family outing to the amusement park. Whether you work alone or in a room with coworkers, a quick one-song rock out loud session is an effective way to beat back exhaustion. In a cube farm? Get everyone to sing along! The key is to choose a song that everyone can sing along with. (I like Kokomo.) The energy boosting effect comes from bobbing your head and singing out loud. One song, 3 minutes. That’s a quick boost of adrenaline that lasts for a bit. You’ll be singing to yourself the rest of the never ending project delivery night. 3. Get rid of the stuffy nose. If allergies have your sinuses blocked, you may be feeling more tired and cranky. An over-the-counter allergy medication should clear up your sinuses (and your mind). 4. Work with your body’s clock. There is a natural ebb and flow of energy throughout the day. We start off sluggish after waking up, even after a solid 8 hours of sleep. Our energy peaks mid-morning, and it’s natural to want a siesta in the afternoon. We get a second spike of energy in the early evening, followed by our lowest energy point just before bedtime. Once you understand this natural rhythm of energy throughout the day, you can work on the important tasks during your peak hours and avoid early afternoon snoozefests (meetings). 5. Have a piece of chocolate. Not too much, but if you’re going to have some candy, it might as well be chocolate. We get an endorphin buzz from chocolate (not to mention the energy boost from the slight bit of caffeine chocolate contains). Dark chocolate has more caffeine than milk chocolate. 6. Have an afternoon power snack. 7. Hit up the water cooler for inconsequential banter. A little midday gossip and random banter is a great pick-me-up for your tired mind. It works because it gets your mind on zero-stress thoughts for a while. The mental break for just a few minutes will revitalize you. 8. Eat lots of berries. Especially berries that are blue, red, or purple. The color comes from anthocyanins, a powerful antioxidant, that boosts energy. Any kind of berry will contain tons. This trick is related to the mood you project to people, and the reciprocating mood they project towards you. If you wear dark, somber colors, you project a dark, somber attitude, and people will respond to you with a somber attitude. If you wear bright, happy colors, you’ll get that attitude projected towards you, which will boost your own mood and energy levels. 10. Take a power nap. But do it in your chair. Don’t lie down on the sofa or you won’t get back up. Keep it short: 5-10 minutes max. Any longer and it will have the opposite effect of knocking you out for the rest of the day. It’s fun, it’s harmless (keep it innocent), and it’s effective. Nothing quite gets the heart pumping like a little flirting. Research has shown that the lavender scent increases alertness. Test subjects were given math tests before and after 3 minutes of lavender aromatherapy. The group completed the tests faster and more accurately after aromatherapy. 13. Wake up at the same time everyday. Including weekends. This sets your body clock. Otherwise, you’ll be wide awake when you should be asleep. Or worse, asleep when you should be awake (dozing off in a meeting is embarrassing). The key is to go to bed at the same time every night. If you need to reset your sleep cycle in one day, stop eating for the 16 hours before the time you want to wake up. Dehydration is a sinister cause of fatigue because it slowly creeps up on you. If you consistently drink less than 8 cups of water a day, you may be sluggish all the time. Get a 32 oz (1 quart, 4 cups) water bottle. Your goal is to polish off 2 of those a day. Try it for a week and see if your general energy level increases. Coffee and caffeinated sodas can boost your alertness, but be careful about letting it be a habitual crutch. The temptation to drink more caffeine to get even more energy will be strong. Eventually you’ll be downing 5 double-shot espressos a day just to function. Drink coffee earlier in the day to avoid insomnia, which will make the next day worse. Energy drinks provide a near-instant hyperactivity boost, but they always result in a crash. Energy drinks are like energy credit cards — you’re spending future energy to get short-term energy. The resulting energy deficit gets worse until you hit energy bankruptcy. 17. Eat low glycemic (low or complex carb) foods. Trade in good, complex carbohydrates (low glycemic index) for the bad, simple carbs (sugar). Carbohydrates with a high glycemic index means the sugar is more easily digested by your body. That results in a spike in energy followed by a low-sugar crash. High glycemic index foods to avoid include white bread, potato, and high sugar foods (like sodas). Low glycemic foods (the good carb foods) include fruits and vegetables, grains (eg., whole wheat bread), low-carb foods (eg., meats), and pasta. Check this chart of foods and their glycemic index before your next trip to the grocery store. 18. Eat more soluble fiber. Soluble fiber is the kind that slows down the rate of absorption of sugars. It evens out your energy levels by preventing a sugar high and crash. (By the way, insoluble fiber is the kind that prevents constipation.) Don’t worry too much about which kind of fiber you’re getting — they’re both good for you. Rotate more high soluble fiber foods like nuts, grains, fruits, plant matter (vegetables), beans, and oats into your diet. 19. Get your Vitamin C.
Get a daily dose of citrus fruits (eg., orange juice in the morning) or a vitamin C tablet. Study after study shows the correlation between citric acid deficiency and chronic fatigue. Vitamin C also helps you absorb more nutrients from food. In addition to the Vitamin C, citrus scents (like orange, lemon and lime) stimulate alertness. So lather on some of that lemon scented lotion. 21. Cover the B Vitamins. B vitamins cover a range of bodily functions, but most B vitamins are involved in the process of converting blood sugar into usable energy. To ensure you get the proper amount of B vitamins, eat a balanced diet. Ex-smokers frequently report an energy boost of 2-3x when they quit smoking. Nicotine affects your sleep, so you don’t get as good a night’s sleep. That makes you cranky, frustrated and tired the next day. Which leads to more smoking. It’s a vicious energy sapping cycle. Playing a game keeps your mind working (versus, say, watching TV), but doesn’t have any of the energy-sapping stresses of work. Go ahead and play that quick game of Scrabble on Facebook, but have a strict time limit if you don’t want your boss to say something. 24. Eat smaller, more frequent meals. Snack throughout the day. By eating smaller but more frequent “meals”, you will maintain a steady dose of energy instead of experiencing food comas. Don’t snack on fatty and sugar laden junk food though. You may get a short 30 minute burst of hyperalertness, but it’ll be quickly followed by a debilitating crash. 25. Enjoy a cup of tea. 26. Splash some water on your face. Just letting the cool water hit your face washes off the grime and stresses of the day. You could also jump in the pool or take a shower for the same effect. Showers stimulates the circulatory system and metabolism. Get wet to feel more energetic. 27. Stand up, stretch and take a couple of deep breaths. Stretch your arms, back, legs, and neck. Take a deep breath through your nose, hold it, and let it out slowly and forcefully. Repeat several times. This will take 30 seconds and will be an instant fix. When you sit back down, you’ll have the clear head and fresh feeling needed to power through the tough/boring task in front of you. 28. Get your world organized. 29. Look on the bright side. A generally upbeat and optimistic outlook on life will keep your energy level up. Yes, the worst thing that can happen might actually happen, but giving it too much worry will only drain you. Look for the positive in every situation and you won’t be so tired. Take one day and just do whatever you want. No work, no chores, no errands. Enjoy your one full day of vacation, then come back to work more motivated and energetic. 31. Eat a satisfying breakfast but a light lunch. A heavy lunch, especially one with lots of carbs or fat (like a burger combo) will hit you as soon as you get back to the office. And it’ll be a sluggishness that lasts to the end of the day. Eat a big breakfast instead. It provides the fuel you need for the day, at the time when your body needs it the most. Not only will you avoid the afternoon food coma, the big breakfast will make you more productive in the mornings. Double win. 32. Choose protein over fat or carbs. Foods with lean (low fat) protein help you feel fuller for longer. It also prevents blood sugar spikes, giving you more steady energy. Lean protein foods include fish and other seafood, lean pork, or chicken breasts (“white meat”). 33. Shed a few pounds. The things you do to lose weight — exercise, drink water, avoid simple sugars — are actions that also have a positive effect on your energy level. Even better, the actual loss of excess fat provides an energy boost of its own. You’ll feel “lighter” and things that use to make you breathless will now seem much easier. Losing weight provides a double-impact to boosting your energy. But be careful with fad and/or crash diets. Cutting out too many calories (ie., energy your body needs) too fast will cause you to be even more tired. Take small steps, and make it a lifestyle change so you shed the fat for life. 34. Listen to tunes while you work. It’s well known that our brain’s pleasure centers light up when we hear music. Throwing on the headphones and listening to any music you like while working will give you a productivity boost. If you have a fairly sedentary life, just the idea of starting an intense exercise program is exhausting. But if you go slow, literally taking one step at a time, you can go from being sedentary to becoming a runner just like Leo. Certain things in our life just cause us to be more exhausted than others, with less value. Identify them, and cut them out. You’ll have much more energy and much less stress. Happiness ensues. Here’s how to eliminate stress from your life. Talk about an endorphin rush! If you keep those endorphins flowing regularly, you’ll have more natural energy. Literally, more bounce to your step. 38. Move gym time to the morning. A lot of people go to the gym after work. 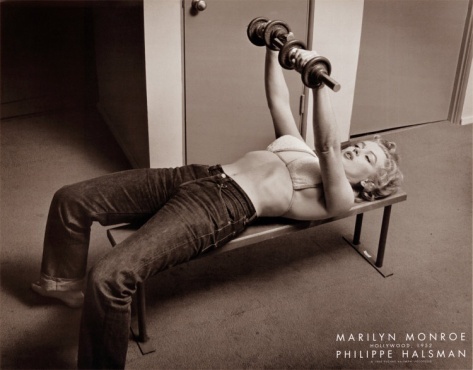 Try going to the gym in the morning instead to get energy that lasts all day. Sure, you’ll have to wake up an hour or two earlier, but you get that time back at night. That exercise in the morning gets the endorphins flowing, which keeps you happy and productive the rest of the day. By exercising in the morning instead of at night, you spend the same amount of time at the gym, but get the added benefit of having more energy at work. 39. Purge low-value tasks from your todo list. If you have a ridiculously long todo list that is impossible to get all the way through, you’ll feel tired just thinking about the todo list. If you want to actually cross off tasks from your todo list, you’ll need to throw out the crap tasks that you don’t want/need to deal with. Either delegate those tasks, move them into a second “nice but not critical” list, or just admit that they’re probably never going to get done and move them to the “maybe/someday” list. Shortening your todo list to just the most critical, must-do tasks will give you the “energy” to start knocking out those tasks. 40. Avoid the mid-day cocktail. If you want to function in the afternoon, avoid alcohol at lunch. Even if it’s just one beer. Alcohol’s sedative effects will take hours to recover from, killing the rest of your afternoon. Loosen up those tight muscles and you’ll feel more relaxed. A more relaxed you means a happier and more productive you. Trade a quick shoulder rub with a coworker after lunch to perk both of you up for the rest of the afternoon. Feeling better about yourself has a magical way of giving you more energy. Put just a tad more effort into looking your best for work, and you’ll get compliments from coworkers that will make you feel better — and make you a perkier, more energetic worker bee. 43. Don’t drink yourself to sleep. Alcohol keeps your body from entering deep sleep, so even if you get the same hours of sleep, you won’t feel as rested. Limit alcohol the hours before bedtime to get the best night’s sleep. 44. Get a thyroid test from your doctor. If you are chronically fatigued, it may be a symptom of hypothyroidism. That’s when not enough thyroid hormone is produced, with fatigue as one of its symptoms. Visit the doctor if you’ve been tired for a long time and haven’t had a checkup in a while. 45. Take a walk outside. Getting outside for some fresh air, a change of scenery, and a quick walk to get your blood going will do wonders for your mood and motivation. Seeing the sun is a signal to your body that it’s not bedtime yet. 46. Lower your blood pressure. Besides being a risk factor for a heart attack, high blood pressure makes you fatigued. If you haven’t seen your doctor lately, go in and get your blood pressure checked. 47. Rotate yogurt into your diet. Yogurt with live cultures keep your digestive system clean, which helps your body absorb all the nutrients from food. That makes you healthier and more energetic. Yogurt is also a good low-fat snack. Laughter is great medicine for exhaustion. Make sure you laugh regularly to keep your mood up. Seek out funny people or subscribe to a daily email joke. I like the geeky comic xkcd for a quick smile. What’s your favorite quick funny pick-me-up? 49. Add more cardio to your gym time. The aerobic exercise gets your blood pumping. It builds stamina and endurance, which is useful for both triathalons and neverending department meetings. The stretching, slow controlled movements, and focus on breathing reduces tension (and stress). The benefits include better sleep, feeling more relaxed, and being mentally sharper. When people have eggs (mostly protein) for breakfast, versus bagels (all carbs), they feel more energy and eat less at the next meal. Protein makes you feel fuller without feeling stuffed, and they provide a steady stream of energy for your body (versus the quick high and crash of carbohydrates). Eggs are a great for breakfast or as an addition to a lunch salad. 52. Get a good night’s sleep. We need 7-8 hours of sleep to be fully rested. Consistently sleeping less than 6 hours a night builds up a “sleep debt” that is hard to recover from. If you’re getting enough sleep, it should take you up to 30 minutes to fall asleep. If you’re falling asleep as soon as your head hits the pillow (or while sitting at your desk), that’s a symptom of sleep deprivation. Ginseng is well-known to have energy boosting properties. It is an adaptogen, which means it build resistance to stress and boosts energy. A ginseng supplement or sipping tea with ginseng can help improve energy. Turn off the Internet and go socialize with friends. Humans are social animals, and we need regular socializing to keep ourselves in peak health and energy. 55. Get on your toes. Roll up and down on your toes. This stimulates your circulatory system, which will deliver much-needed oxygen and fuel (glucose) throughout your body. You’ll be more energized and sharper. You can do this right now. With the Olympics happening right now, how can you not be inspired! There is so much talent in this world and it’s so exciting to see it all in one place. I could say that I am completely all about Team USA, but with all of the hard work that all of these athletes have put in, I believe everyone deserves a huge round of applause and recognition. So, GO TEAM!!!!! Scroll down to see amazing photos of some of the Olympics great women athletes, courtesy of Yahoo.com. 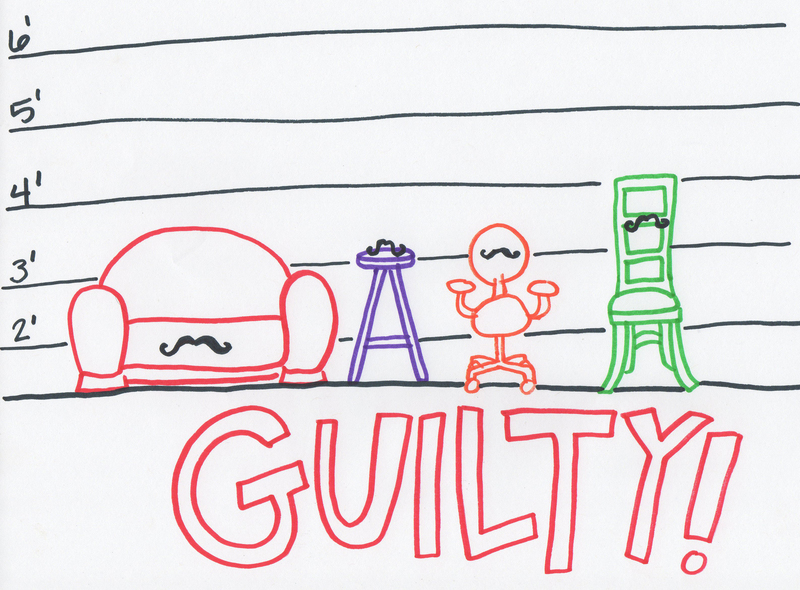 Whatever You Do…DON’T SIT DOWN!!! Women’s Health Magazine had a great article on this unfortunate killer and I highly suggest you read through it! You might not want to take the following stat sitting down: According to a poll of nearly 6,300 people by the Institute for Medicine and Public Health, it’s likely that you spend a stunning 56 hours a week planted like a geranium—staring at your computer screen, working the steering wheel, or collapsed in a heap in front of your high-def TV. And it turns out women may be more sedentary than men, since they tend to play fewer sports and hold less active jobs. But thanks to technological advances, the Internet, and an increasingly longer work week, that environment has disappeared. “Electronic living has all but sapped every flicker of activity from our daily lives,” Levine says. You can shop, pay bills, make a living, and with Twitter and Facebook, even catch up with friends without so much as standing up. And the consequences of all that easy living are profound. When you sit for an extended period of time, your body starts to shut down at the metabolic level, says Marc Hamilton, Ph.D., associate professor of biomedical sciences at the University of Missouri. When muscles—especially the big ones meant for movement, like those in your legs—are immobile, your circulation slows and you burn fewer calories. Key flab-burning enzymes responsible for breaking down triglycerides (a type of fat) simply start switching off. Sit for a full day and those fat burners plummet by 50 percent, Levine says. That’s not all. The less you move, the less blood sugar your body uses; research shows that for every two hours spent on your backside per day, your chance of contracting diabetes goes up by 7 percent. Your risk for heart disease goes up, too, because enzymes that keep blood fats in check are inactive. You’re also more prone to depression: With less blood flow, fewer feel-good hormones are circulating to your brain. Sitting too much is also hell on your posture and spine health, says Douglas Lentz, a certified strength and conditioning specialist and the director of fitness and wellness for Summit Health in Chambersburg, Pennsylvania. “When you sit all day, your hip flexors and hamstrings shorten and tighten, while the muscles that support your spine become weak and stiff,” he says. It’s no wonder that the incidence of chronic lower-back pain among women has increased threefold since the early 1990s. And even if you exercise, you’re not immune. Consider this: We’ve become so sedentary that 30 minutes a day at the gym may not do enough to counteract the detrimental effects of eight, nine, or 10 hours of sitting, says Genevieve Healy, Ph.D., a research fellow at the Cancer Prevention Research Centre of the University of Queensland in Australia. That’s one big reason so many women still struggle with weight, blood sugar, and cholesterol woes despite keeping consistent workout routines. In a recent study, Healy and her colleagues found that regardless of how much moderate to vigorous exercise participants did, those who took more breaks from sitting throughout the day had slimmer waists, lower BMIs (body mass indexes), and healthier blood fat and blood sugar levels than those who sat the most. In an extensive study of 17,000 people, Canadian researchers drew an even more succinct conclusion: The longer you spend sitting each day, the more likely you are to die an early death—no matter how fit you are. Jack at 40 years of age. Yes….impressive. Jack LaLanne was the first to bring health and fitness right into the homes of those who had a television at the time. He is a large part of American history! Jack LaLanne made living a healthy life possible for everyone and his words of wisdom continue to live on! Here is a list of those famous words! What’s it doing for me? If one apple is good, you wouldn’t eat 100.